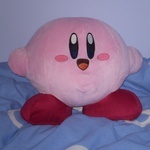 Out of all of the games in the Kirby series, which boss battle or battles were/was the most difficult for you? The most difficult boss fight for me was probably Star Dream Soul OS in Kirby: Planet Robobot. The player will likely need to pay close attention to what the boss is doing during the third phase as taking too long will cause Star Dream Soul OS to use its infamous "FATAL ERROR" attack, which is very difficult for the average player to dodge and will likely KO Kirby. I was stuck on this boss for about two weeks because I was too slow and did not really understand that I needed to absorb the debris and use the Planet Buster attack. In other words, I completely understand that it was my fault due to a lack of understanding what to do and I have learned what to do since. Star dream soul OS was the hardest for me as well. Probably because I want to use Kid icarus's controls but it's NOT THE SAME CONTROL SCHEME AAAARG. oh yeah, and you get no healing items and there are FOUR (4) STAGES. The Xbox 360 isn't the only one with Red Rings of Death you know. Star Dream Soul OS has them as well. Oh, and most invincibility actions don't work. I rarely enough get to the star dream fight because of her, and when I do I have like 50% health left with no pep brew so I don't get very far.